Switch: Mystery and Suspense on Television. Eddie Albert stars as Frank MacBride, a retired cop, and Robert Wagner as Pete Ryan, an ex-con, who form a private investigation agency in Los Angeles that specializes in conning con man. Assisting them are Malcolm Argos (Charlie Callas) and Maggie Philbin (Sharon Gless). 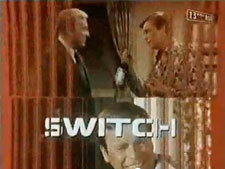 Switch aired on CBS for three seasons.